Colocasia leaves are popularly known by the name of alwa paan or pathrade paan in Konkani households. They are found in abundance during the monsoon season which coincides with festival season in India and hence preparation from alwa paan/pathrade paan is a must during festival celebration in GSB house. 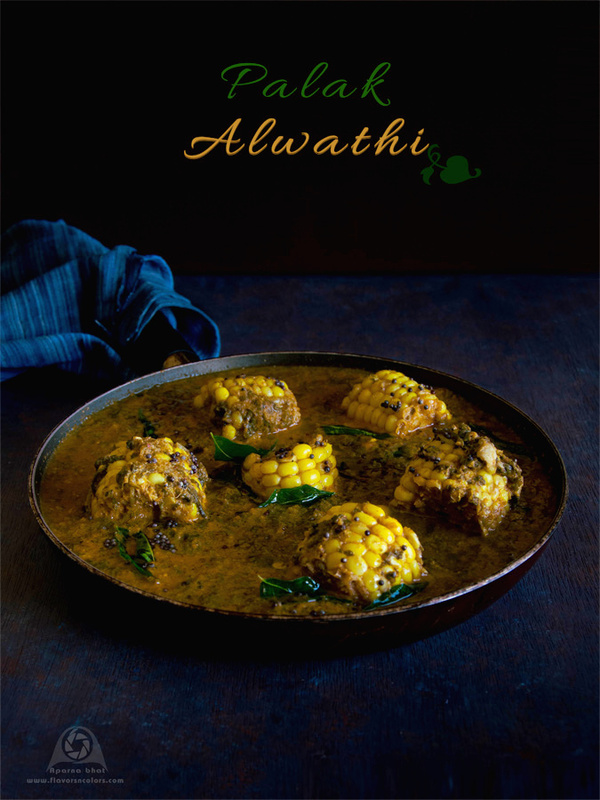 Alwathi is one such recipe that is prepared as tradition during Krishnaashtami and Nopi/ Ananth Chaturdashi. Seasonal availability of this paan and its rare availability in Indian stores here made me stay away from cooking this delicacy for a decade. Luckily it was during one of the Krishnashtami celebrations I came across palak alwathi prepared by family friend. The taste was super. Since then whenever the tastebuds crave for alwathi this is what I cook and we all enjoy at home! Place the shredded palak, fresh peanuts, slit green chillies, grated ginger in cooker vessel. Add little water and pressure cook it for 3 whistles. Thaw the frozen cobs and cut into pieces. Cook it with salt in boiling water for about 5 mins. Once done transfer it to pan along with palak and keep it aside. Grind the coconut, roasted red chillies and tamarind to a fine paste. 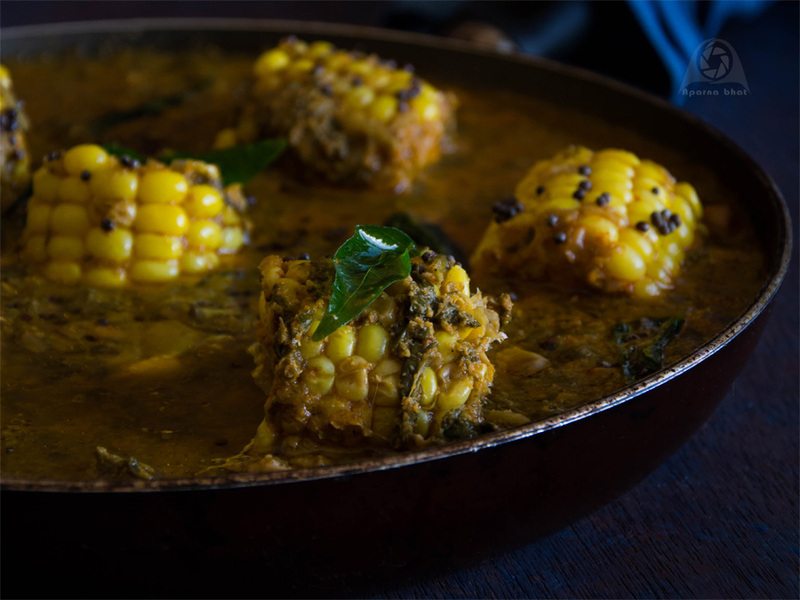 Add this paste to palak corn mixture in the pan. Add salt according to requirement. Allow the mixture to come to a boil. Meanwhile prepare seasoning in small pan with oil, mustard seeds and curry leaves and pour it over the cooked mixture. Switch off the flame and Alwathi is ready to be served.